We’ve met these critters before. 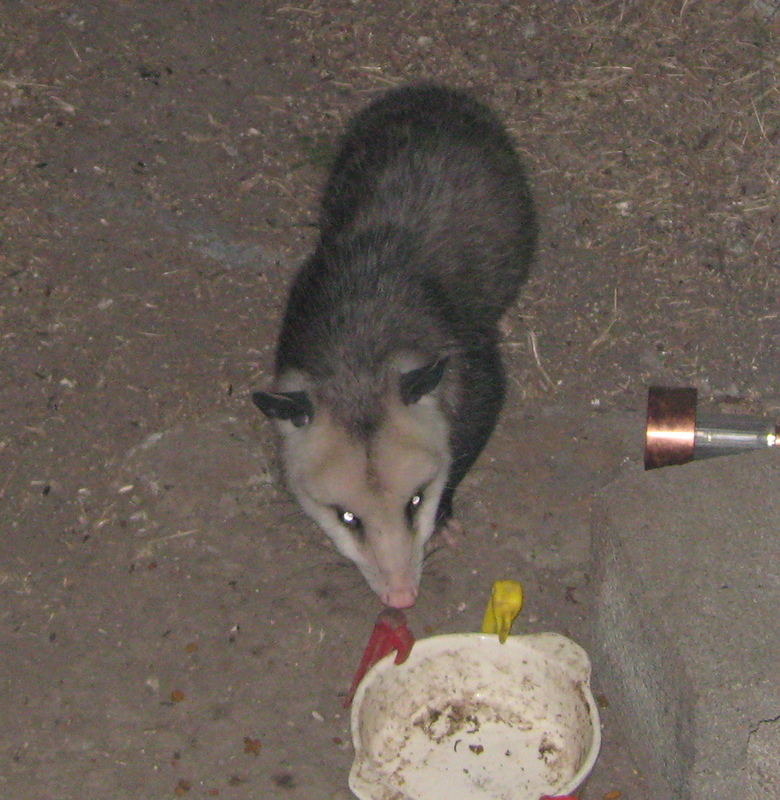 MM has appeared frequently, but the possum has only appeared on the blog once. Assuming it’s the same one; we’re still not sure. 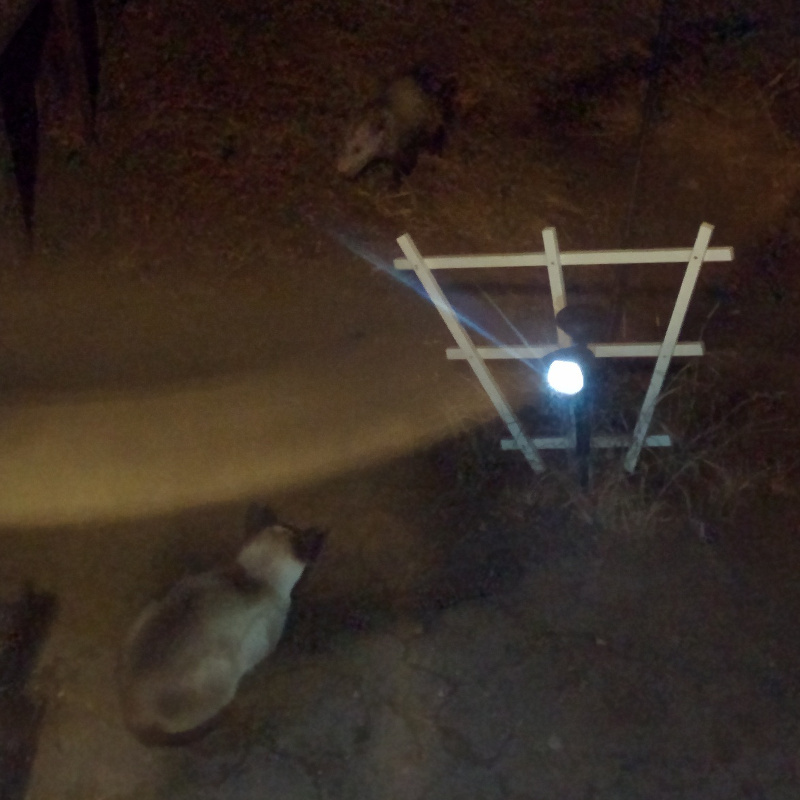 In any case, he doesn’t come by the bowl often, and usually late at night, after the cats have gone wherever they go to sleep. So this is the first time we’ve seen him interacting with any of the other visitors. It was a peaceful encounter. 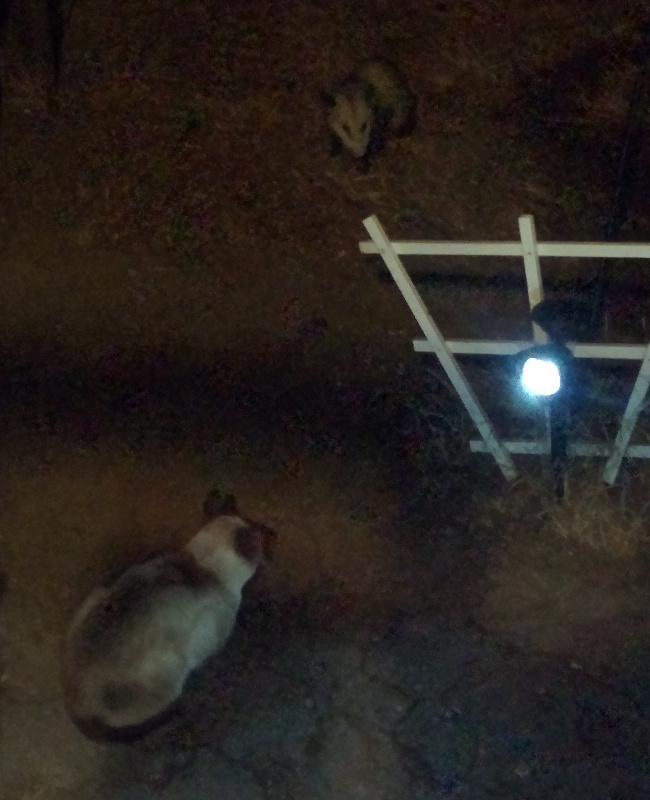 They appeared to chat for a couple of minutes–perhaps discussing the difficulties of having light-colored fur in the wild–before the possum nibbled a few bites of food and ambled off. MM watched him carefully, then trotted away in the opposite direction. The backyard food bowl is open access. Even though it was intended for felines, we don’t object to any of the neighbors dropping by for a bite, as long as they behave themselves. No fighting, no wasting of food, and no destruction. This guy (or gal–we’re not at all sure) drops by from time to time for a quick meal. Since he generally doesn’t show up until after the cats have taken their turn at the bowl, we don’t object. He’s working the “so ugly he’s cute” thing, and doing a pretty good job of it, especially when he braces one of those little pink hands on the edge of the bowl. We don’t have a name for him–actually, we don’t even know if it’s always the same one showing up, but we’ve never seen more than one possum at a time. Any suggestions?